According to this assessment, the original recommendation to the IFCN board was accept with edits. Legally founded in 2010, Animal Político is one of the most renowned online native news outlets of Mexico. Beyond that, it can be described as one of the most well-known and influential brands among the Latin American online native players. Since January 2015 it runs a section called El Sabueso (‘The Hound’), focused on fact-checking. Animal Político publishes fact-checks about different topics and people on a relatively regular basis: throughout the last year analyzed (January 2017-January 2018), some weeks have been found with two or three fact-checks, although there were also some weeks without any fact-check. As this variability can be attributed to the normal news flow, and since Animal Político has been running its fact-checking activity uninterruptedly for more than three years now, publishing more than one fact-check monthly on average, this assessor concludes that this organization complies completely with the requirements. El Sabueso works with the same base methodology for every fact check. After the selection of the claim, which is always evaluated and chosen based on public interest, the next step is to reach the author of that claim in order to know the original source that was used. This allows us to have a fair, accurate and contrasting exercise of fact-checking in every claim. The construction of every Sabueso follows the same structure: an open paragraph to remind the claim, the data/revelation that we used for the conclusion, and the rate. After that, we show the position of the author of the claim after El Sabueso's consult and the full explanation of our discovery with the use of full data, graphics, or interviews with experts. Also, all the sources are fully visible with the links, the files, papers or official data that we download and use during the fact check. El Sabueso fact checked Mexican politicians from any party, any authority who managed public resources -Federal or from the states-, and actors involved in the public sphere. According to the evidences provided by the media outlet in their application to IFCN, as well as the analysis of their fact-checks made for this assessment, I conclude that Animal Político covers a variety of subjects or speakers in a fairly balanced way. Without leaving aside some other personalities, fact-checks are frequently targeted to the members of national Government, State Governors, as well as their supporting political parties. However, this tendency is deemed normal, as in every country the news scrutiny usually focuses on power holders. All the staff must accept and practice the Ethics Code in order to be part of the Animal Politico’s team. Animal Politico does not respond to any partisan, religious, political, or any other interest that may coerce, compel, or obstruct our journalistic mission. Journalists, collaborators, executives, and members of the editorial board are responsible to keep impartiality in order to ensure that interviews, news, and any journalistic work responds only to the public interest. The personal points of view, feelings, or political and moral preferences of the members of the team should not prevail over the objectivity and editorial criteria of Animal Politico. The non compliance of the Code of Ethics is translated into the cease of the labour relation. Based on the same evidences indicated above, as well as a sample of links provided by the applicant, I conclude that El Sabueso - Animal Político does not, in any way, advocate in favor or against any electoral candidate. Animal Politico works under a publicly accessible Ethics Code, which is compulsory for every of its staff members. This Code prevents journalists from any partisanship. El Sabueso sources are fully identify in the fact-check. Every time that we use data, we mention the source.It’s easy to verify that every paragraph includes the complete name of the source, clearly referenced. El Sabueso provide the links to the sources, the files, papers or official data that we download and use during the fact check. We also add graphics, audios and videos in order to explain the use of data. Each of this includes always the source. The fact check is done in a way that we explain every data, why we choose each source, and how it was used. This has the objective that any reader can replicate the exercise. In its fact-checks, Animal Político provides regularly a set of links to reliable sources of data, as the readers can check by themselves the truthfulness of the analyses. El Sabueso is one of the strongest bets of AnimalPolitico.com, as it's one of the main sections in the website As we will describe in further details, El Sabueso involves a great amount of teamwork: reporters, editors, multimedia, video producers and community managers are committed to the project. The sources of income during 2017 for Animal Politico were: Training/Coaching to civil organizations or media: 15% Advisory: 10% Advertising: 45% Grants: 25% Donations: 5% Animal Politico has a donation program: https://donadora.mx/plans/animalpolitico Each month, Donadora releases the amount Animal Politico earned during the last 30 days. El Sabueso - Animal Político has included detailed information about the origin of their funding in the last year. As a consequence, assessment upgrades to complete compliance. In their signatory application, Animal Político has provided some general information about their funding policy. According to their report, “the sources of income during 2017 for Animal Politico were: Training/Coaching to civil organizations or media: 15% Advisory: 10% Advertising: 45% Grants: 25% Donations: 5%”. All this information could be a bit more transparent (indicating, for instance, the organizations that awarded grants), and those details could be disclosed to the public in their Quiénes somos (‘About us’) page. Although complete disclosure about the owners behind this news outlet is provided in that same page, little details can be found about the spending during the current year. All in all, the information about this news website’s financial structure could be somewhat expanded and improved. Because in Animal Politico we believe all our journalists must understand the value and importance of fact-checking, all of them are part of El Sabueso team. This is a section of our digital media and all the team works on it on daily basis, but also in the special fact-checking coverage that we've made. A full directory of Animal Político’s journalists and staff members is available on the website. In addition, every news story and fact-check provides information about the journalists behind the news, including a link to their email and Twitter handle. The authors of fact-checks are clearly disclosed, providing accessible means of contact (usually, their Twitter handle); this allows readers to send corrections to the journalists, if needed. 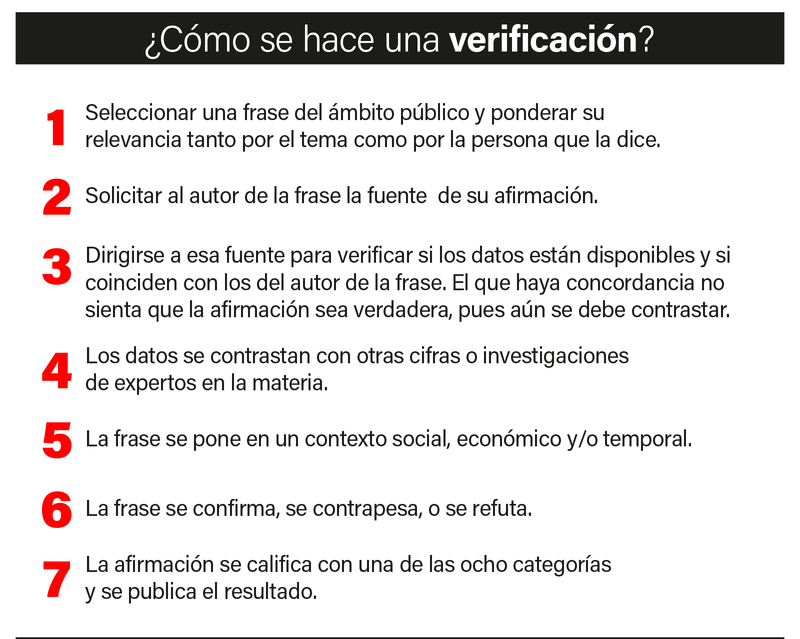 El Sabueso - Animal Político has included a clear, easy-to-find link to their fact-checking methodology page. As a consequence, assessment upgrades to complete compliance. Animal Político provides enough details of how they proceed with fact-checks. However, there is room for improvement on the accessibility to that key information: we recommend to put it into a permanent and easy-to-reach page. Today the details about their fact-checking methodology are somewhat hidden into an old and hard-to-find page from January 2015. That relevant information should be more accessible. Animal Politico is a digital media with a special communication with readers through social media. In Mexico is not common that media outlets answers to the readers, they only post their news. That’s why the readers recognise easily that it is possible to have a dialogue with Animal through social media. We try to ask for claims through our website adding an email in the fact checks published, but we quickly understood that we obtain better results if we make it in Twitter and Facebook. We have the mail elsabueso@animalpolitico.com but we receive more claims and suggestions in social media. Animal Político shows very clear and accessible means of contact to fact-checkers, that allow readers to send their claims. The manual explains: Animal Politico / El Sabueso publish the full letter or message sent by the interested party; if a correction it is made, we add an Editor Note in the top of the text. We add an answer from the editorial team when it’s necessary and in social media we publish that a correction it was made. El Sabueso - Animal Político has included an easy-to-find online form for corrections. As a consequence, assessment upgrades to complete compliance. In their application, Animal Político provided two examples (1, 2) of corrections to fact-checks. These examples demonstrate their will to be transparent with corrections. However, they don’t have any page that displays somewhere in their website –preferably in their fact-checking section– their correction policy. This minor deficiency should be corrected. done_all 6b marked as Fully compliant by Ramón Salaverría.